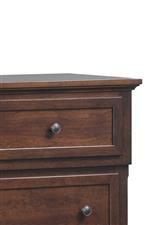 This king size sleigh bed brings tranquil transitional style to your bedroom. 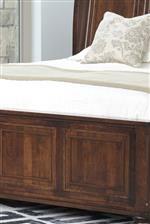 Its large raised panels and bun feet add a touch of elegance to this sleigh bed. Inspired by the picturesque yet relaxed style found in the West Indies, this piece is sure to usher you off to a deep nights sleep. The Brigantine Transitional King Sleigh Bed with Low Footboard by Palettes by Winesburg at Dinette Depot in the Brookfield, Danbury, Newington, Hartford, Connecticut area. Product availability may vary. Contact us for the most current availability on this product. 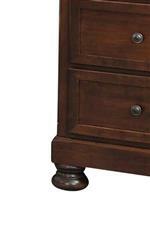 The Brigantine collection is a great option if you are looking for Transitional Tropical furniture in the Brookfield, Danbury, Newington, Hartford, Connecticut area.